If you show the Exif panel, do you see any data in there? No. "n\a" in every field. When raw file opened in Develope persona it's similar - "No camera data", "n/a" in all fields. no problem here (v1.6.0.89). 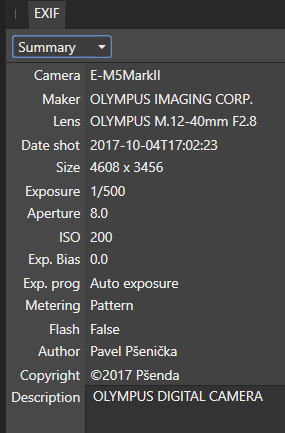 Exif Data are showed up whatever file is directly opened coming from my X-E1 or X-T1. Hi! Is anybody here solving this issue? I read in other topic that "exiftool" process should be active in task manager along with AP. On my PC there is no such process when AP is working. What to do? 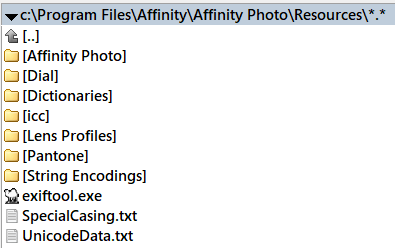 All EXIF and IPTC data are removed by import (tif's and jpg's from Capture One). Please fix that with high priority. I've just tried some samples of X-E1 files in 1.6 and they are importing EXIF correctly. 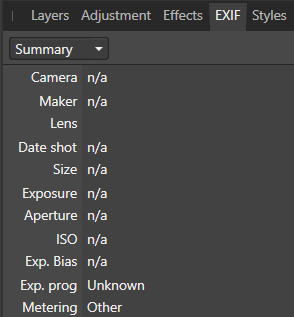 Can you upload a sample raw file that is not importing the exif information? Here is last file I've just opened in AP 1.6. In Develope persona - 'No camera data' and 'n/a' in the fields of EXIF panel. In 1.5 everything was OK. I think problem isn't in the file or camera cause files of my Sigma DP2 in 1.6 open in the same way (without EXIF). On my opinion problem is unworking 'exiftool' by some unknown reason. 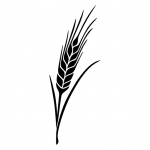 Have you installed the application into a folder/path name containing non-roman characters? If you have affinity Photo running you should also be able to see a background process called exiftool.exe running in Task Manager. It is this process that handles the metadata. If it's not running then the pathname may be the problem. Could you let me know if you see that process ? I've seeked - no such process in Task Manager when AP 1.6 running. Do you have any information in the event log or the antivirus/firewall logs about exiftool.exe being blocked or failing to run? pauls, sample file's been uploaded to your link. There was no prompts from antivirus or firewall about blocking of exiftool. Furthermore I've been tried to start AP with stopped antivirus and firewall and have got the same result - no exif in file in AP. Can you suggest, please, how to browse the 'event log'? The Event Viewer is a Microsoft Management Console (MMC) snap-in. You can start Event Viewer by adding the snap-in to MMC or by double-clicking the snap-in file, Eventvwr.msc, which is located in the %SYSTEMROOT%\system32 folder. In addition, Event Viewer can be started from the Windows interface or the command line by using the following procedures. Click System and Maintenance . Windows 10 just type control panel into the search box by the windows icons in the taskbar. I have the same problem (in Windows 10 Pro, Czech version). in AP nothing (same jpeg picture). Path to AP and yours exiftool is standard. If run AP, exiftools not in event list. 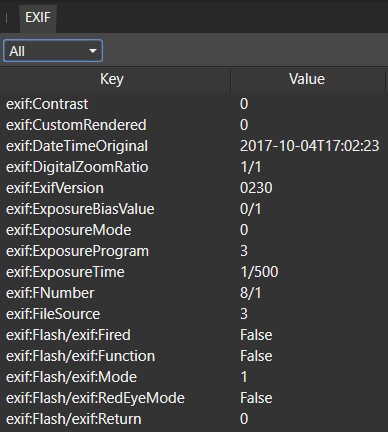 If run ExifToolGUI, exiftool is in event list twice. and maybe problematic with Czech characters: c:\Users\Pšenda\AppData\Local\Temp\par-509a656e6461\cache-exiftool-10.61. But in AP 1.5 works correct. Hi, it will be due to the unicode characters in your username - however we've identified a fix for this, and will have it available shortly. Yes, problem is in my username. If I run like Administrator, works fine. But I should have request. AP offers three EXIF view type, that do not suit me. but not all item for my interrest. For example in ExifToolGUI, which offers a custom configuration - Workspace. and Value is not interpreting to readable description.